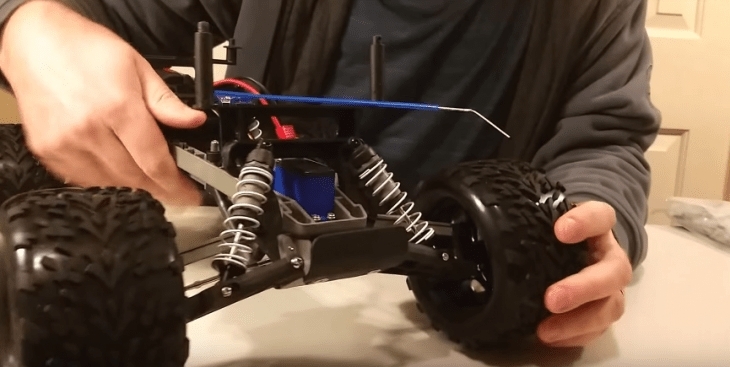 Best RC Truck Under $200 Reviews: Top-5 in April 2019! Radio Controlled vehicles come in a number of models, these include buggies and trucks, which are both off and on-road applications. In this article, I look at the toy market side of this hobby, where the price reflects the level of structural integrity and the level of technology used to construct these models. Only two of the models would be considered applicable as starter racing trucks. However, like a toy or introduction to the wonders of RC models, all five of these are the best and come at attractive prices that reflect good quality products. What is included in these five options are the time to operate and recharge, the motor and speed, and the overall construction and materials used? These are all ready to roll models; they do not need assembly, just take them out of the bix, put in the batteries and start having some fun. The Traxxas Stampede is one of the original high-performance monster trucks and can reach speeds in excess of 30mph. 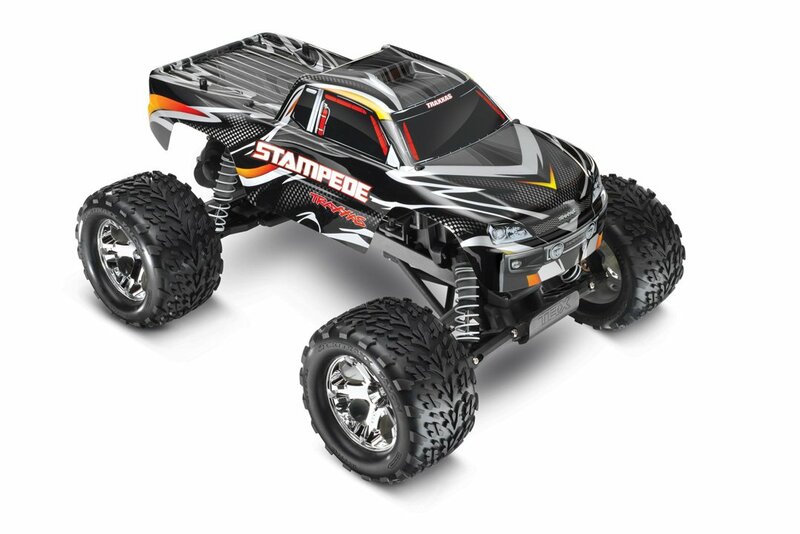 The Traxxas Stampede uses the Titan 12T 550 modified motor, which delivers a low maintenance performance. To keep temperatures down, this model has an integrated cooling fan that pulls cool air through the vent tunnels that are molded into the motor plate. Combined with the Titan, comes the XL-5 Waterproof Electronic Speed Control and the EZ-Set® one-button setup. This system comes with three drive profiles, low voltage detection, a thermal shutdown protection gauge, gold-plated connectors, and extremely low resistance. 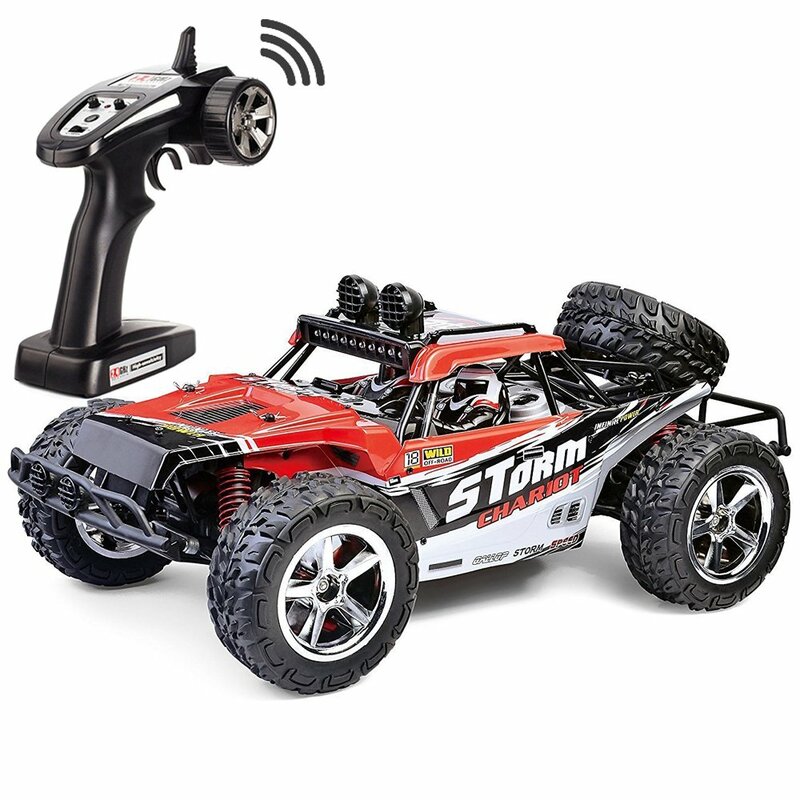 It uses the Traxxas 4-amp NiMH Peak Detection 4-amp DC-DC Fast Charger that is perfectly tuned to provide speedy energy to the NiMH iD Power Cell Battery 7-Cell Hump, Sub-C, 3000mAh Traxxas Power Cell NiMH Battery with iD™. To assure you that your model will remain protected, it comes with the TQ 2.4GHz Waterproof Receiver box that seals the electronics from any water, mud, snow and other wet conditions. This is a Ready-To-Race® model; you don’t need to assemble it, or paint it, or buy parts for it. Just unpack it, and launch. This is a Traxxas, it doesn’t get much better than this, and the price is not as hefty as you might think, but maybe that’s because this is a standard motor and not the more expensive brushless model. It doesn’t really matter since the performance of this beast is amazing. This is the GPTOYS S920 1/10 46 km/h “Judge” Monster Truck 2.4G 4WD RC Car RTR in Blue, it’s a new model and delivers excellent results. The GPTOYS S920 is a powerful and vibrant monster truck model that comes with 1/10 scale detail. This is a waterproof model for use in adverse conditions, and you can operate it in any weather and over all terrains. The new models come with the Half Flip Cover, so it makes maintenance much easier. This model reaches speeds up to 46kmh and has a double-motor power system with a self-priming air cooling system. The controller is a standard 4-channel 2.4Ghz pistol transmitter that gives you two-speed modes. The construction of this model integrates sealed ball bearings, with a metal drive cup, and a metal transmission shaft enclosed with a metal A-arm in a semi-metal chassis. The drive is 4WD, and you get basic controls over direction, and the transmission distance is up to 8 meters. The expected racing time is around 10 minutes, and charging is 2.5 hours, this model is powered using 7.4V 1600mAh Li-ion battery pack. This is a very basic model from a toy company; it is not a premium model for racing and other professional RC hobbies. As such, this is a perfect toy and gift for children who want to enjoy the benefits of a fast RC experience. 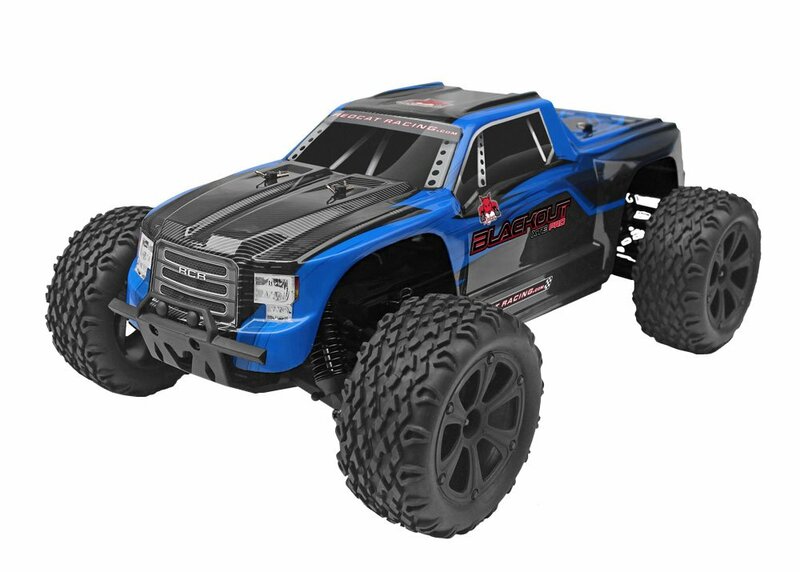 The Traxxas Slash short-course race truck is a beautifully designed and flashy monster truck model with 3.5” clearance and a powerful motor for speed and terrain adaptability. If it’s a flash of colored light that whizzes by your face in the next offroad competition, you were just buzzed by a Traxxas Slash. 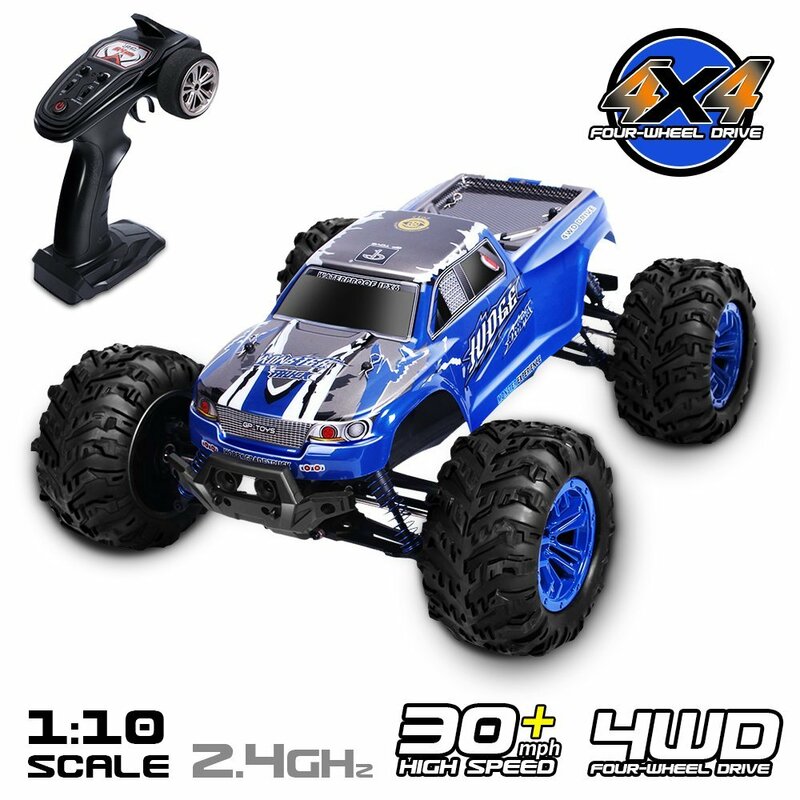 This monster truck uses a unique 1.10 scale design and integrates many exceptional features to deliver a near perfect performance racing RC model. Before I present the outside, let’s delve into the inside, this Traxxas model uses the Waterproof Sealed Receiver Box with their TQ Receiver. As such, this model can now use its proven XL-5 electronic speed control and the sealed mini receiver to go across every terrain in every weather condition. The XL-5 Waterproof Electronic Speed Control works the Titan® 12T 550 Motor, and that means you get a monster model with a monster Titan 12T 550 modified motor. You also get the integrated cooling fan to keep temperatures down. 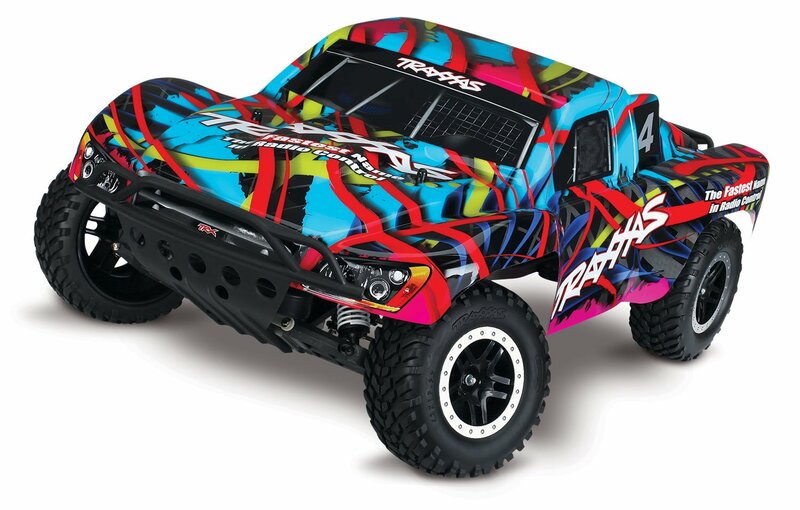 The Slash comes 100% Fully Assembled and Ready-To-Race®, and it is controlled by the installed and adjusted for performance TQ radio system powered by the Power Cell ID-equipped 7-cell NiMH battery and recharged using the Traxxas patented 4amp fast charger. If you need to show off, and you have the budget for this, go ahead, make my day. Show some flair, show some color, and wipe out the competition. This is an amazing model that looks and feels like a pro. This is the FSTGO 1/12 scale RC 4WD Desert Buggy that reaches over 35mph. This is a classic combination of size and price, with a 1/12 full proportional vehicle, that is powered with rechargeable 7.4V 1500mAh Li-ion-Fe car battery pack, and a 4WD, this beast reaches speeds in excess of 35mph and will provide you with 15 minutes of continuous driving. This is a very budget friendly model for the beginner and as a fun toy for children. The buggy design makes it perfect for backyards and around the house. However this is not an all-weather model and is not waterproof or water resistant, so keep it in dry condition. This model comes with a three-stage differential gear and is fitted with the auto industry, anti-slip rubber tires. The shockproof system is an individual helical spring for each wheel. The standard 2.4GHz Radio Control delivers a 50-meter range of power. This is the perfect children’s gift that makes being a kid fun. It is fast, and it is strong, but it’s a very basic model that comes with a standard market price. A wonderful gift, but don’t buy this for competition or professional use. This is the Redcat Racing Blackout XTE PRO that comes with a professional KV3800 brushless electric motor with the built-in heat sink, and forward/reverse ESC. This is a professional RC model for serious hobbyists. When it comes to performance, this is one good contender, this is a semi-pro model and is a very good serious competition beginners model. The price reflects the brushless motor and technologies used to craft this exceptional model. The chassis is made of lightweight plastic and has four oil filled adjustable coil over shocks, with independent suspension for each wheel. There are a 40mm ground clearance and a wheelbase of 290mm. The 540 brushless motor KV3800 with 4mm Bullet delivers a fast punch of power and is controlled by a standard waterproof 2.4GHz radio system. This is a great starter model for professional racing, while the price is right, it is a serious commitment to starting an interesting career in hobby RC model racing, where the professional models reach four-figure prices. You might think that 35mph is fast, and it is, but understand that the difference between these trucks and the real deal is that the pro trucks are made of metal, come with high-end motors, special power packs, and expensive controllers. The reviewed items are toys designed for fun and for kids of all ages, from 5 to 75, anyone with a love of racing and cars will always get a kick out of racing one of these basic but elaborate RC scale models. Air Filters for Dodge Cummins – Buyer’s Guide!